Notice! The first basic version of "Build your outfit" tool is ready! More details and demo are available here. In this article, we would like to share our new idea for CS-Cart and Magento based online stores. Product designer add-on developed by our team gave us an inspiration to develop a new functional module – “Build your outfit” module. As far as we can see, it can be a great tool for online clothing store owners or owners-to-be. 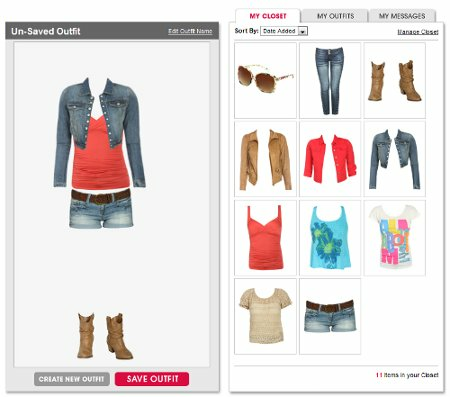 According to our idea, the “Build your outfit” add-on will allow customers to make their own outfit online by putting together different clothes and accessories to get the desired look. Our Product designer add-on has already a basic functionality for "Build your outfit" module. It definitely needs some serious work to achieve our set goal but it's all possible to do. How "Build your outfit" will work? We would like to show you some website examples which use a similar tool. Wetseal is a popular online store. You may choose items which appeal to you, choose size, click "add to closet" and go to “My boutique” to create an outfit putting together your chosen items. 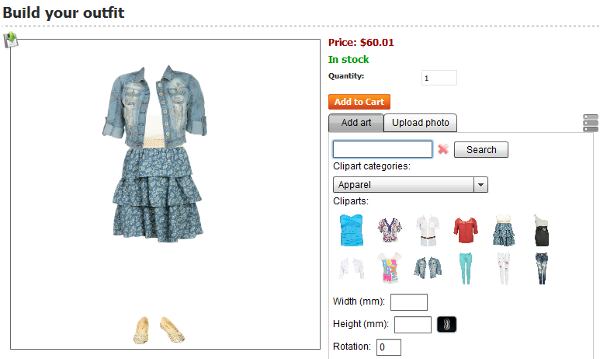 Polyvore. It's a fashion community website where people can easily create outfits online by mixing and matching stuff from available gallery or by importing items from online clothes shops. save created outfit and send it to a friend. This way you may get your friend's opinion or offer an outfit to your friend. or it might be possible to dress up a model. 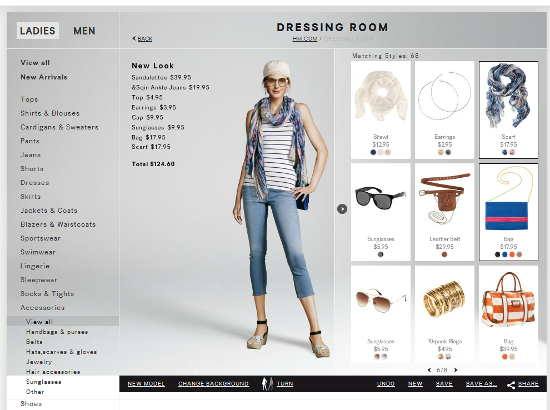 For example, popular brand online store H&M also offers virtual dressing room where customers can dress up a model in H&M clothes. It's a usual thing – girls have lots of clothes in a wardrobe, but they don't know what to put on this morning. And it's not a whim. It's really difficult to combine skirts, shirts, jeans, jackets, shoes which do not match each other. There is a good solution to avoid this problem - buy clothes online and build outfit every time using online outfit builder provided by an online shop. Hope you agree, it’s great to see what clothes will look like together before making a purchase. Good news for online store owners or owners-to-be - there are too little online stores which offer such a great possibility for shoppers. So, you can make your store unique by adding "Build your outfit" functionality. More good news – Alt-team would be glad to implement an outfit builder program for CS-Cart and Magento online stores selling apparel and accessories. We just need to hear your opinion about this tool. Would you use such a tool? We would also appreciate your wishes about the features which can be included in “Build your outfit” module. Please feel free to leave comments on this blog article. Building an outfit online can actually become an interesting and helpful leisure activity for many people. It will help to choose right clothes and express yourself. Also, it can be entertaining to dress up your friend. Anyway, even if you can't buy all of your created outfits, you can feel like a fashion stylist. "I think this is very cool and will get very far in life"
"I just love this, I am opening my own online store this coming summer for my own clothing line and was looking for something like this, just saw what H&M are using and love that...what Jason Oconner says about customized clothing order...it is just what I have in mind...since I will sew everything according to order...thought it would be cool to have the same dress but many option for the front top piece and maybe the skirt....would be cool to be able to make samples of the top pieces only to add it into such a system so people can actually design their own alfit...that´s what people like today, to make their own style:) Not to have a store tell them what to wear. Would like to talk to you more:)"
"Hello everyone! Alt-team is glad to announce that the first basic version of "Build your outfit" tool is ready. Please go to this page http://www.alt-team.com/build-your-outfit-tool.html to learn more details." "Hello, what's the status of this project? I'm searching for something like this..."
"hi, i also wait for this. i will buy it an may be you can also develope a version for joomla. but i will be happy with any solution. it would be also great if you can do it with svc and canvas so that it will work on mobile devices... flash is not available on this sh... so may be in a second step, great... so i can not wait to get it. "yes i think its great and cant wait to get it on my site!" "Yes this would be a great idea for clothing stores. In-fact we are in the process of launching such a project. Our business will be customized clothing too. It would be nice if a customer can also select fabric type & pattern, sleeves & design, color type & design, buttons, etc etc. It will be a good one for those who have tailor business (customized clothing order on demand. I would definitely buy such a addon. You can contact me for discussion at (e-mail edited)"
"i will definitely buy it....please do it ASAP..i am really happy to buy it..thanks "
"Wetsealboutique works awesome, i believe such tool can attract more customers to online store. Guys, your idea is great providing great realization"
"I don't run an online clothing store but if I did, I would definitely use such a tool. I know how girls love to try clothes on, to build outfits and similar dressing up stuff. "